Due to price and fuel efficiency, Iran’s Saipa cars have become some of the most popular on Baghdad’s crowded streets. But “Saipa” has also become Baghdadi slang for reckless teenage drivers, overcrowded cars, accidents and even sexual harassment. It’s not the kind of publicity that most car manufacturers would want. But unfortunately for the Iranian car makers, in Iraq the Saipa brand name has become shorthand for bad drivers, accidents, unreliability and even – interestingly enough – the harassment of women. After the Iraqi Ministry of Trade first began importing this brand of car in 2010 from the neighbouring country, Saipa vehicles became a familiar sight on Baghdad’s streets. The brand is competitively priced, with a smaller vehicle like the four cylinder Tiba costing consumers around US$6,300 when they buy directly from the government and up to around US$6,800 if they buy privately. In a country where other small cars cost more – for example, a Volkswagen would set Iraqis back around US$20,000, the smallest Saipa, the one best known in Iraq, has become very popular. According to US news agency, the Associated Press, US car maker General Motors “sold 32,000 vehicles in Iraq last year. That is up from 19,000 in 2010 and fewer than 1,500 just five years ago”. Meanwhile the Ministry of Trade says they sold 30,000 Saipa cars by the end of 2011, and that’s in Baghdad alone. Iran is one of the largest car makers in the world and the automotive industry is the second most active industry there after the gas and oil industries. 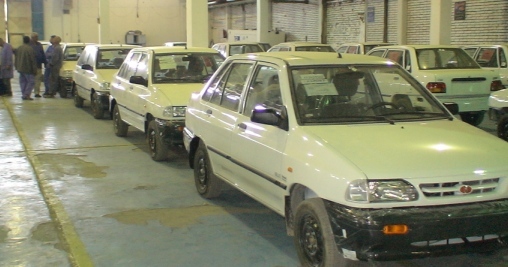 Iran’s Saipa car company was founded in 1966 to manufacture French Citroen cars under license in that country and over the past few years Saipa has also worked together with Kia and Renault. However over the fairly short time they’ve been on the Iraqi market, Saipa cars have garnered an increasingly bad reputation. Baghdadis pronounce the brand name “Saba” and the term has quickly become shorthand for drivers who don’t obey traffic rules or who drive recklessly. According to typical stereotypes, Saipa drivers also harass Iraqi females. A student of political science at the University of Baghdad, Alia Sadiq, tells what happened one time she took a Saipa cab. Frightened, Sadiq did give the driver her number so that he would drive her home. But as soon as she got home, she threw that SIM card (and phone number) away and swore never to take another Saipa cab ride. The Saipa’s reputation for reliability is also patchy – even local car dealers are quick to agree that they believe the vehicles’ quality doesn’t compare well to other motoring brands. Car dealer Thamer al-Kathimi, whose business is in the Baya neighbourhood in west Baghdad, explains that locals tend to buy Saipa cars because of the purchase cost, the cheap maintenance costs and the fuel efficiency. A small Saipa like the Tiba model does between 100km per six to nine litres (around 39 miles per gallon) in the city. Additionally, al-Kathimi explained, one of the most common reasons for buying a Saipa was because it was going to be used as part of a taxi business. And this is how many Baghdadis now see the typical Saipa driver: young men, who are either unemployed and illiterate, or recently graduated and waiting for some kind of government job. And while they’re unemployed these young men start working as unlicensed cab drivers in order to earn some income. Often the small Saipas can only comfortably seat three – one driver and two passengers – but they’re usually carrying four or five people. Saipa cabs tend to charge less than the drivers in other, more reliable and expensive cars and again, this makes the Saipa more popular. In fact, Baghdadis with a sense of humour have been known to regularly post videos of Saipa car crashes on the Internet – because there seem to be so many of them. And although official figures on the details of auto accidents are scarce, at least one traffic policeman said that Saipa cars are one of the major causes of accidents in his area, Karkh in western Baghdad. Nonetheless all of the humour at the Saipa’s expense doesn’t seem to have deterred the many young Iraqis who drive them. They tend to be proud of them. As this story was being written, a Saipa car was spotted bearing the legend: “Beware of bigger cars”. The owner had obviously written the tongue-in-cheek slogan on the car, well aware of the Saipa’s size and reputation. And so far the Iranian car manufacturer’s business doesn’t seem to have been adversely affected either. In late 2010 Saipa built a manufacturing plant in the Iskandaria neighbourhood of Baghdad. Saipa’s website says the factory can produce around 80 new cars every day.